ISIS in Iraq is no more. Between 1,000 and 1,500 ISIS militants surrendered to Kurdish forces after the last remaining ISIS-controlled city of Hawija was overtaken and returned to Iraqi control. The once ferocious fighters were timid and afraid, most smelling of feces and urine, having not used a toilet in many days, still visibly shell-shocked by the constant bombardment by American air power. I have been saying for many years that 99% of the insurgents fighting for ISIS and other rebel groups were not and are not Islamic extremists. They were simply broke and sold their souls to the devil for $100 a month. You can credit President Donald Trump for this victory. He set out to defeat ISIS thoroughly and quickly and has done that. 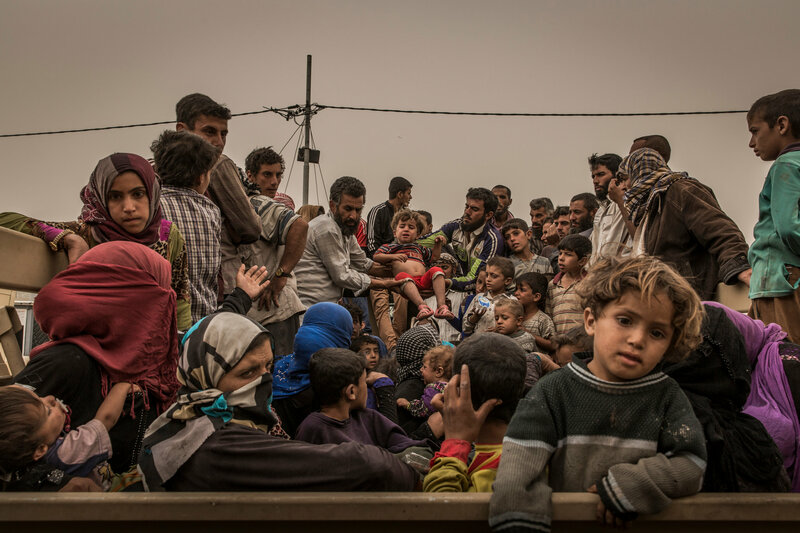 You can blame Barack Hussein for the misery these people have suffered and all the people in the war-torn region, most of whom have lost family members to the terror brought on by ISIS. Barack Hussein created ISIS. He pulled American troops out of Iraq when they were needed desperately to keep the region stable until the Iraqis could defend themselves. They couldn’t and ISIS beheaded its way to control of vast regions of the country, murdering innocent Iraqis in gruesome public displays. I wrote an article earlier today blasting the New York Times for its lack of journalistic ethics and leftist bias in an undercover story by Project Veritas. The following Times article is an outstanding piece of journalism. If only they could publish such worthy, nonpartisan, objective journalism all the time. 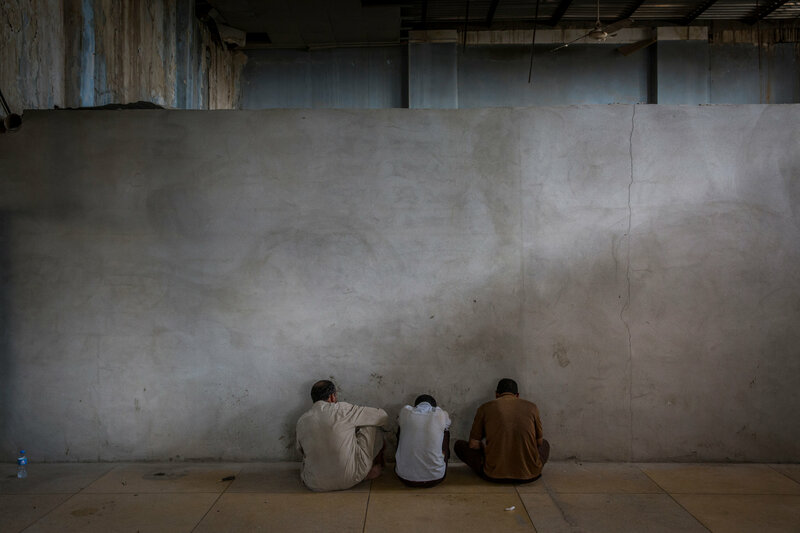 DIBIS, Iraq — The prisoners were taken to a waiting room in groups of four, and were told to stand facing the concrete wall, their noses almost touching it, their hands bound behind their backs. More than a thousand prisoners determined to be Islamic State fighters passed through that room last week after they fled their crumbling Iraqi stronghold of Hawija. Instead of the martyrdom they had boasted was their only acceptable fate, they had voluntarily ended up here in the interrogation center of the Kurdish authorities in northern Iraq. For an extremist group that has made its reputation on its ferociousness, with fighters who would always choose suicide over surrender, the fall of Hawija has been a notable turning point. The group has suffered a string of humiliating defeats in Iraq and Syria, but the number of its shock troops who turned themselves in at the center in Dibis was unusually large, more than 1,000 since last Sunday, according to Kurdish intelligence officials. The fight for Mosul, Iraq’s second-largest city, took nine months, and by comparison, relatively few Islamic State fighters surrendered. Tal Afar fell next, and more quickly, in only 11 days. Some 500 fighters surrendered there. The Iraqi military ousted the Islamic State, also known as ISIS and ISIL, from Hawija in 15 days, saying it had taken its forces only three days of actual heavy fighting before most of the extremists grabbed their families and ran. According to Kurdish officials, they put up no fight at all, other than planting bombs and booby traps. Seen up close, the fighters’ pretense of bravado soon disappears. Their shoes were taken from them, their pockets emptied and their belts discarded, and, as they stood facing the wall, the backs of their dishdashas were stained with the evidence that some of them had not been to a toilet in days. One of the men smelled so bad that when he was taken into the small interrogation room, those inside were startled. He filled the doorway, appearing even larger than his actual size. The interrogator unbuckled his hip holster, resting his right hand on his pistol. Everyone in the room seemed scared of the man, even though his hands were tied behind his back. His thick black hair was Medusa-wild and shoulder-length, though his handsome face had only a wisp of black stubble on the chin. “Hello,” a visitor said. “Where’s your beard?” The Islamic State requires all men to grow full beards. “I’m only 21, I can’t grow it yet,” he said, clearly embarrassed. 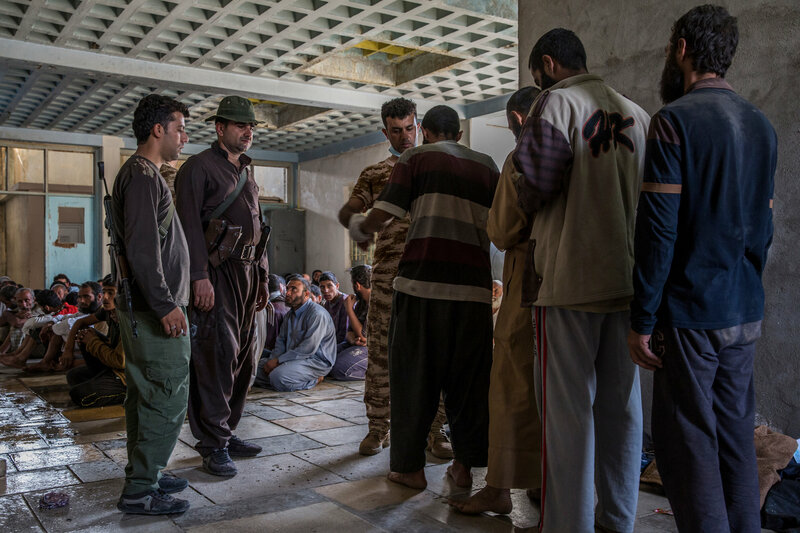 Kurdish interrogators allowed a dozen of the surrendered fighters to be interviewed by a reporter as they arrived at the local headquarters of the Asayish, the Kurdish intelligence service, in the town of Dibis, near the Kurds’ front lines opposite Hawija. Officers monitored all interviews. Many of the fighters claimed to have been just cooks or clerks. So many said they had been members of the Islamic State for only a month or two that interrogators suspected they had been coached to say that. Gone was the contempt for the world’s opinion, spewed out in one violent video after another — many of them made in Hawija, where grisly killings, especially of Kurdish prisoners, were the norm during their three-year reign over that Sunni Arab city in northern Iraq. Most of the prisoners, though, claimed to have never seen a beheading, or even heard of such a thing. At first, the beardless fighter seemed an exception, admitting defiantly that he had been fighting for the group for two years, alongside family members. He readily gave his name: “Maytham Muhammed Mohemin,” he said, practically spitting it out. His hands were bound behind his back and he was effectively sitting on them, forced back into a red plastic lawn chair, yet the three Kurdish officers in the room kept more than an arm’s length away in case he lunged for their weapons. During the interview, he grew nervous. He said he was from Hawija and had joined the Islamic State because he believed in its cause, because his elder brother had, and because the $100 a month pay was better than anything else around. He had arrived in Dibis on Thursday afternoon with eight companions, seven Iraqis and an Egyptian, after they dropped their weapons in Hawija that morning. Since the beginning of the Iraqi offensive two weeks earlier, they had spent most of the time burrowed in foxholes to escape the relentless American bombing and shelling by advancing Iraqi forces, and had passed days without sanitary facilities or food. Finally, the Islamic State wali, or governor of Hawija, told the men to turn themselves in to the Kurdish forces, known as the pesh merga, and to flee the advancing Iraqi Army and its Shiite militia allies, the Iranian-trained Hashed al-Shaabi, notorious for killing not only Islamic State prisoners but also their entire families. Mr. Mohemin denied ever attending a beheading but later, prompted by an Asayish intelligence officer, he admitted going to one, he said, because he had been ordered to. His prospects are grim. His pregnant wife had fled to Dibis a week before him, but it was unlikely he would see her or their expected child, their first, anytime soon. His elder brother was killed in combat. His father and little brother, one too old to pledge to the Islamic State and the other too young, had disappeared. The interrogator, Lt. Pisthiwan Salahi, said Mr. Mohemin was not only an Islamic State soldier but also a member of an elite suicide squad known as the Seekers of Martyrdom, according to informers. If convicted of that affiliation by an Asayish court, his sentence would be long; if he was connected to any killings, possibly lifelong. To identify the militants, Kurdish intelligence officers pored over videos from Hawija, such as ones showing pesh merga prisoners in orange jump suits in individual cages on the backs of pickup trucks, being paraded through town to be stoned, then set afire or beheaded in public. Crowds of thousands participated. Another, Hussein Jamal, 21, said he had pledged allegiance to the Islamic State in 2014 but had remained only 45 days. “Ask him why he didn’t come out sooner then,” one of the interrogators suggested. “I was afraid,” Mr. Jamal said. 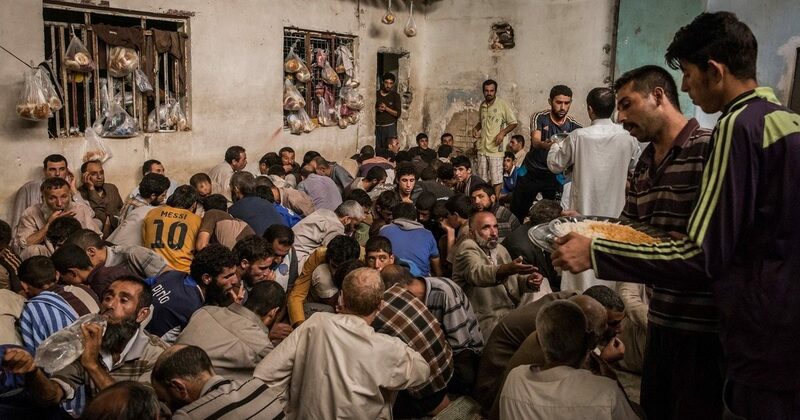 “Ask them why they fled this way,” another of the interrogators suggested. Both men said that they were certain that the Hashed al-Shaabi militias would kill them, but that the Kurds would not. Mr. Mohemin had shrunk back into his red chair after an hour of talking and looked much smaller than before. When asked if he thought he would see his wife again, or his new child, he said, “I don’t know,” and looked at the floor. The lieutenant did not take his eyes off him for a second. “They’re just planning to go underground and make sleeper cells,” he said. Mr. Mohemin shook his head. “This is the end of this state,” he said. He had wet his trousers, adding to the smell, but did not ask to use a toilet. “I believe if the governors are telling us to surrender, it really means that this is the end.” He swore to God that he was telling the truth.